If you've never been to the Northern Territory, you probably won't truly understand what the phrase "only in the Northern Territory" encompasses. However, a few days is all you need in Australia's 'Top End' to know why so many locals grin when they hear it. Quite simply, the Northern Territory can't be recreated anywhere else in the world; not its environments, culture or experiences. Still sceptical? Take a look at a few of the unique things you can do during your holiday. Enjoy VIP treatment while being flown from one iconic Outback pub to the next in a private helicopter. The Heli Pub Tour, courtesy of Airborne Solutions, combines scenic flights with quality watering holes full of stories, novelties and charismatic locals. The line-up of pubs includes some of the NT's most renowned establishments such as Humpty Doo Hotel, The Lodge of Dundee and Goat Island Lodge, where you can enjoy the famous 'Buffalo Burger'. With access to a slew of the region's most distinct locations and an assortment of delicious cold beer on tap, this tour combines two of the Northern Territory's best features. About 1.5 hours from Darwin via boat, Bare Sand Island reminds everyone who visits exactly why Australia's history and wildlife continue to fascinate the masses. The island's population of flatback turtles is the main attraction, with regular tours letting visitors witness the egg laying and hatching that occur between April and October. Grounded firmly in conservation, Bare Sand Island offers one of the few opportunities around Australia to get up close to the turtles and learn about their journey from egg to adult. Visitors are also taught about the island's Second World War history and Indigenous heritage. Situated inside Nitmiluk National Park, Cicada Lodge combines luxury with Indigenous culture, giving guests a rare chance to explore the stunning region just as the Jawoyn people do. Go from elegant and contemporary rooms with private balconies to the untamed wilderness, home to Katherine Gorge and numerous unforgettable experiences. Local Indigenous guides lead you to ancient rock painting sites and teach you survival skills, while highlighting the region's most beautiful features. Exclusivity abounds when you take to the skies in the lodge's helicopter and land at otherwise inaccessible waterholes with waterfalls and untouched nature. Arguably the top outdoor experience in the Northern Territory, Outback Floatplane Adventures runs wildly popular tours across some of the region's most famed wilderness areas. 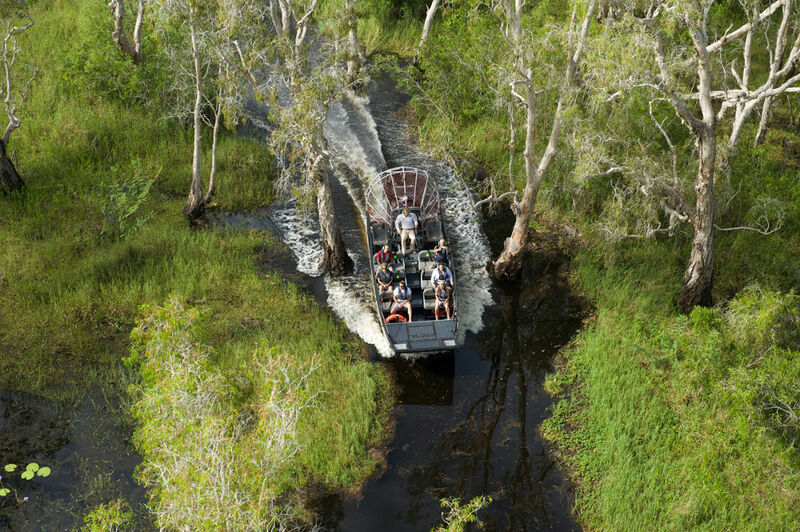 Opt for the 'Ultimate Tour', which incorporates a helicopter, riverboat, floatplane and airboat to help you see crocodiles, boars, buffalo, turtles and more native wildlife. One of the highlights is the eerie floatplane landing on Sweet's Lagoon where the 5.1-metre 'Monster Croc', Sweetheart, was caught in 1979. There's also a scenic helicopter flight over the Finniss floodplains and an airboat tour across the wetlands, giving you plenty of opportunities to spot the deadly animals. The Tiwi Islands archipelago is comprised of two main islands and nine uninhabited islands. Home to a large population of Indigenous Australians, it's one of the best places to immerse yourself in Aboriginal culture, history and traditions. During a Tiwi Islands Adventure sailing tour you can learn to throw a spear and play the didgeridoo, while tasting the rather bold meal choices of bush tucker. The community is passionate about cultural art and has numerous pieces for sale at three Indigenous art centres where you can also watch the artists or try your hand at painting or carving. There's also the Pukamani Poles ritual to be learned and a deeper understanding of the community's history to be garnered from exhibits at the local museum. Fishing takes on a new level of excitement when you stay amongst the Mary River floodplains at Bamurru Plains. Safari-esque bungalows grant you direct access to some of the NT's best fishing areas for Barramundi during the wet season. Alternatively, you can take an airboat out to the Swim Creek floodplain and cast right off the side. After a day well-spent fishing, retire to your comfortable room and settle in with the sounds of nature right outside.